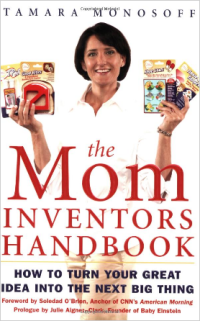 The Mom Inventors Handbook takes inventors from idea development to marketing and sales covering everything from prototype development, getting patents and trademarks, finding funding, manufacturing, licensing and distribution. Here's what the author says about naming your business. What's in a name? A whole lot, especially when you're building relationships and an image with buyers, vendors, and customers. That's why choosing an effective name is a vital early step in developing your business. That said, feel free to explore and brainstorm business names! One of most common mistakes I see is when inventors name their company the same as their product. For example, if you invented a day-glo dog leash you named your company "Day-Glo Dog Leashes, Inc." it would be tough to release any other pet product through the same company name. Naming your company the same as your product can inhibit growth, defining your company in terms that are too narrow. You may think now that this is the only product you plan to ever develop and bring to market. However, if you truly have an inventor's mindset, you will continue to think of one product idea after another. Julie Aigner-Clark, founder of the Baby Einstein Company, started her business as a single product company with her first video to stimulate and educate infants. Under the general name of Baby Einstein, she was able to beyond that single video to add countless more videos and educational products. She turned her small home-based venture into a multimillion dollar company that was eventually acquired by Disney. Similarly, take the time to think of a company name that's "big" enough and that feels right to you. Like naming a new baby, this can be a fun and creative experience! Another error to avoid is naming your company something that's meaningful to you but meaningless to customers. Many mom inventors I've observed combine their kids' names in some way. While it's cute, it can also result in names that are difficult to remember, hard to understand, or tough to pronounce (picture yourself answering the phone all day using this name as a test). Also, your name needs to convey the right image for the company. Ask friends and family for their suggestions and feedback. A word of caution here—like naming your baby, asking family can be touchy, especially if they really dislike the name you have chosen. Once you have decided on your company name, search the Internet and purchase the domain name that you have selected. (See the section later in this chapter on consulting ICANN, a government-sponsored site that regulates facets of the Internet. This site will help show you how to obtain a domain name.) Hopefully someone else will not already own the name you've chosen. Companies that sell domain names often offer packages with e-mail address accounts along with your domain name. These e-mail accounts can further legitimize your business and present a professional image, as opposed to using an e-mail account with a Hotmail, Yahoo, or AOL address. (I even know businesswomen who use e-mail with their husband's name. This implies they are not technically savvy, and it is highly unprofessional.) This is also a tip-off that you are a small (sometimes interpreted as "unstable") company. Presenting your company as a serious player from the beginning, by using an e-mail address name of your company, will allow you to prove yourself and the credibility of your company to others ... retailers in particular.